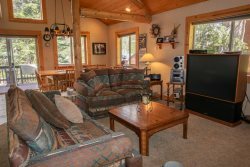 Pyramid Peak Properties can accommodate your next vacation to South Lake Tahoe, Fallen Leaf Lake, and Kirkwood Mountain Resort with beautiful, rustic Lake Tahoe vacation homes. Youll love these gorgeous vacation rentals, including condos and homes. We have lakefront rentals, ski-in ski-out rentals, pet friendly rentals, and a few Lake Tahoe rentals that are long-term. No matter your itinerary, we have Lake Tahoe vacation homes for every traveler and every trip. Book your Lake Tahoe rentals with Pyramid Peaks, a company of local professional property managers looking to make your stay in this gorgeous California paradise one for the books. Pyramid Peak Properties has an extensive inventory of Kirkwood vacation rentals. We offer true Ski-In/Ski-Out, pet friendly, and long-term ski leases in this popular area. Choose from Kirkwood Mountain Resort vacation lodging including alpine or Nordic skiing. You can also select from over 60 cabins, condos, and homes. The Kirkwood ski resort is home to some of the best snow in the west, so take your family, friends, and even your pets to the slopes. * Base elevation 7,900 feet. * 14 lifts. * 2,300 skiable acres. * 65 designated trails. * Cross Country Nordic Center. * Wonderful summer hikes and wildflowers. * 20 lakes within 5 miles. * No hustle and bustle. You can find all of our available Kirkwood Mountain Resort lodging below. Interested in learning more about the Kirkwood ski resort? Click here. Here is a great selection of South Lake Tahoe vacation rentals including condos and homes. Whether you are looking for something small and charming or something spacious for the whole family, we have a space for everybody. Our South Lake Tahoe home rentals are conveniently located near ski resorts, beach marinas, and other fun attractions. Choose from South Lake Tahoe cabins within lush green forests, or enjoy your time on the water in some of our other South Lake Tahoe home rentals. Additionally, no matter if you stay in our South Lake Tahoe cabins or in our condos or other housing, you will always have a way to get your exercise. You will be close to hiking trails, canals, and more. Our current options for housing are on the lakefront or in Christmas Valley. Regardless of the housing you stay in, you will experience perfect views. Come stay with us any time of the year! Many guests and visitors eventually become locals after enjoying their stay at Fallen Leaf Lake in California, tucked away in the Sierra. These vacation cabins and homes have a sense of remoteness while still close to South Lake Tahoe; each rental is nestled deep in the trees, and being in the woods just cannot get any better than this. Fallen Leaf has that old Tahoe feel, and is a popular portal into the Desolation Wilderness of the Eldorado National Forest and Lake Tahoe Basin. Great fishing, sightseeing, and relaxationall available to you when you stay at our Fallen Leaf Lake cabin rentals. Do not forget the amazing camping spots and boating as well when you visit Fallen Leaf Lake, California. Need additional information about this location after looking at our Fallen Leaf Lake cabin rentals? Click here to see what has everybody moving to Fallen Leaf Lake. Enjoy waterfront and lakefront rentals at Lake Tahoe. Whether you are looking to relax and entertain in the summer or winter, our available housing can do both. Our Lake Tahoe lakefront rentals can accommodate as many as 12 guests -- a perfect opportunity to bring your family on a boating trip or skiing adventure! What makes our housing different is our unique selection; the rentals set each other apart in appearance and amenities. With this, we can definitely say we have the right Lake Tahoe lakefront rental for your needs. If you are searching for lakefront rentals to complete your vacation, we have them here in perhaps the most breath-taking place in the States: Lake Tahoe. Book your next vacation rental in South Lake Tahoe, Kirkwood, and Fallen Leaf and bring your pet! Pyramid Peaks has many pet friendly lodging options, so you can bring your animal companions no matter where you go. A majority of our housing also accommodates several guests, so you can take the whole family! Our pet friendly rentals in Lake Tahoe are located near all of the fun activities your pets will love, including hiking trails and ski slopes. Best of all, there is plenty of space for them in our pet friendly lodging! No need to leave Fido at home -- take him along on the adventure with you and enjoy our pet friendly rentals in Lake Tahoe. Kirkwood and Lake Tahoe long-term rentals often extend 4 to 5 months or more. One big advantage is the much lower average cost per day on a long-term. A great benefit of a long-term lease is the ability to come and go as you please, leaving behind all your personal belongings for the next trip up to the mountains! Bring your gear, clothes, and food up once, and then just hop in the car and head to your long-term lease with very little trip packing or hassle. Select Kirkwood or Lake Tahoe long-term rentals for your next stay here. Many of our rentals are available for a long-term Lake Tahoe or Kirkwood ski lease as well, which often covers December through April. These types of leases are payable upfront with utilities added. These long-term ski-leases are an affordable way to use the property as often as you like, where an entire month costs about that of a weekend standard vacation rental. Book your next long-term lease ahead of season for the widest selection of vacation rentals. When you have a Lake Tahoe or Kirkwood ski lease, you are even able to ski without hassle while you are staying at your housing.